Little Mrs. Married: Places to go, people to see! Initially, I was a bit worried about this weekend. It was one of those jam-packed with things-to-do, people-to-see, places-to-go - none that I was willing to give up! When i woke up feeling yuck on Sunday morning, I was even more worried, but it was all good! I felt a lot better after I got a long nap! I think we can assume that was just due to exhaustion! So anyway... my weekend! It was a lot of fun! Friday night? Well, nothing. I came home, got in my PJ's & did the email/facebook/blogger/pinterest thing (it's my nightly routine, in that order). Saturday was my mother-in-law's birthday! We went over there for breakfast. Jaimie cooked & everything was delicious! 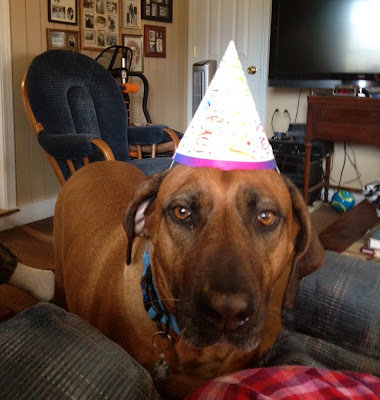 Fani was really excited to wear this hat to join the celebration. Ha! Sunday I woke up feeling really bad. Got ready for church & at the last second decided not to go. I was just feeling terrible! I ended up napping from 11 to 1:30 - and maybe that's all I needed? I felt much better when I got up! I'm so glad, because I had some plans! 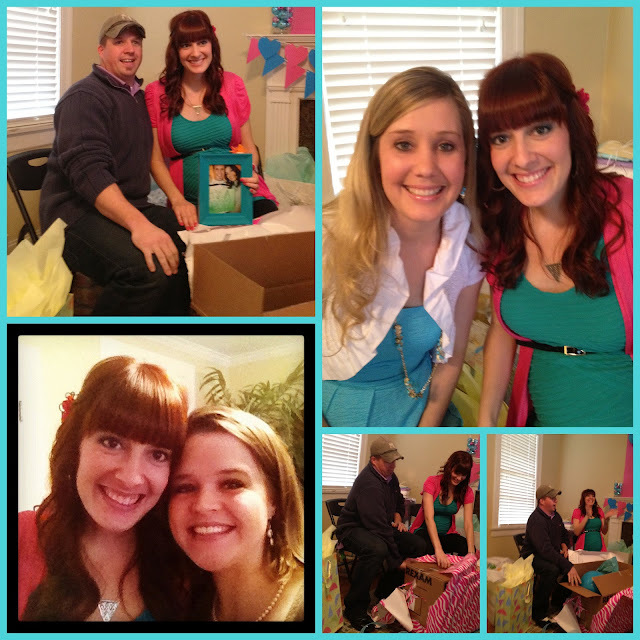 First, was Abby's gender reveal baby shower. So fun! So, Abby & Mac chose to do a gender reveal shower. Everything was decorated so cute! I voted boy & I was right! (I have realized that my guess is always right... the only times I've been wrong is when i changed my guess at the last minute - should have stuck with my gut! Haha! Obviously, it's a 50/50 chance, but it's still fun to take a guess!). Anyway, they already knew before the shower, they were just announcing to us. You can see in the bottom two small pictures that they're opening a box - i was a little late getting the shot of the balloons popping out, but you can see a stray blue balloon inside the box! :) There was lots of family there (they have a huge awesome family) finding out if they were having a grandson/nephew or a granddaughter/niece, so that was fun to watch too! The top pic of Abby & Mac is them holding a pic that says It's a Boy - perhaps i should have gotten a close up. Next to that is a pic of Abby & her oldest sister Aimie, who was my roommate for years & years & years until we finally both got husbands. Haha! I love her so much! And then the bottom left pic is of me & Abby. She is a doll! So happy for her & Mac. My weekend was amazing enough already, but I would have to say that the highlight of the whole thing was meeting Lindsey from A Dollop of my Life. I was having a really hard time editing this one & finally just did black&white! We had almost NO lighting & it was with my cell phone! That's my story & I'm sticking to it! Haha! 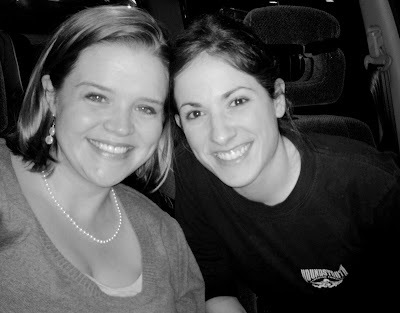 So anyway... my next post may be about why it's so awesome to meet blog friends in real life, but I just have to tell you that i LOVED meeting Lindsey & I am wishing we lived a bit closer! She was so sweet & funny & easy to talk to. It was just comfortable hanging out with her & I can't wait to meet up with her again! We had a great time. Thanks for taking the time to meet up with me, Lindsey! Yay for great weekends! I love the balloons coming out of a box for the gender reveal! Great idea!